The Energy Saving Trust has a raft of advice for homeowner on how to reduce their carbon footprint, save energy and reduce their heating bills. All buildings lose a certain amount of heat through the windows or patio doors. One way to reduce this is by replacing your single-glazed windows with modern double-glazing. Double glazing works by having two sheets of glass with a space between them that traps air creating a barrier of insulation. This keeps the heat inside and the cold air outside much more efficiently that a single pane of glass. However, some double-glazing is better at this than others so check the manufacturer’s efficiency rating for their product before your order. A- rated windows are the most efficient and G are the worst, if the windows don’t have the BRFC label rating then ask your supplier for one, although they’re not obliged to label their products. They may also have the Energy Saving Trust Recommendation label too. The best type of glass to select is called Low-E glass this is because it has a low ability to emit radiation. Invisibly coated with a metal oxide on one of the inside panes, it allows light and heat to filter into your house through the glass but traps it inside without letting it out again via the glass. 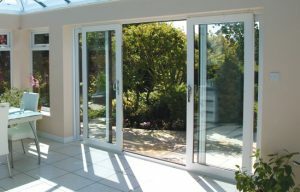 Frames types can range from wood, UPVC to metals such as aluminium or steel. Choose the frames to suit the style of your home. Also think about changing the window layout, for example which windows are the ones that open, and which side they’d open from within the frames. Draught proofing your windows will also save money on your energy bills so check the sealing in case it’s deteriorated over time and is letting cold air in and heat out. Check to see if you need extra ventilation added to your walls in case condensation from more efficient windows causes mould or mildew build up. And if you live in a listed building or in a conservation area and are thinking of completely replacing your traditional old wooden sash windows with UPVC, make sure you check the regulations as you may find you’re forced to keep the character of the house intact and only have wooden frames.